P-dog's blog: boring but important: Astronomy midterm question: Saturn high overhead at sunrise, then eventually at midnight? 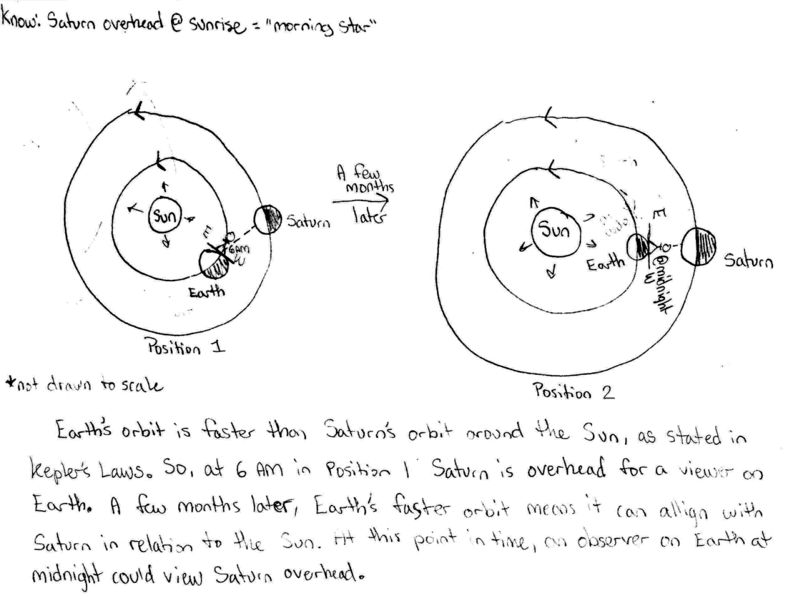 Astronomy midterm question: Saturn high overhead at sunrise, then eventually at midnight? Say Saturn is overhead at sunrise. After a few months, Earth will have moved faster in its orbit than Saturn such that Saturn will then be visible overhead at midnight. Discuss why this answer is correct for an observer in San Luis Obispo, CA, and how you know this. Support your answer using diagrams showing the positions of the sun, Saturn, Earth, and an observer on Earth. a few months later, Earth has "caught up" to Saturn and they are (approximately) "lined up" with the sun (superior conjunction), such that the observer on Earth at midnight is able to see Saturn overhead. Nearly correct (explanation weak, unclear or only nearly complete); includes extraneous/tangential information; or has minor errors. Draws both diagrams: one correct, the other with slight errors. PContains right ideas, but discussion is unclear/incomplete or contains major errors. Draws both diagrams with errors; or has one diagram correct, the other missing/problematic. Limited relevant discussion of supporting evidence of at least some merit, but in an inconsistent or unclear manner. Some attempt at one diagram, with errors; the other is missing or effectively missing.